Box 10.6), perissodactyls are a part of the clades Laurasiatheria and Ferungulata, and they are a sister group to (Carnivora + Pholidota). The perissodactyls, such as horses, tapirs and rhinoceroses, are distinguished from the artiodactyls, or even-toed ungulates (2 or 4 toes), by having an odd number of toes (1,3, or 5). Perissodactyls diversified in the early Eocene, replacing basal placental groups (see pp.329-33) as dominant browsing herbivores. Some of the first perissodactyls were horses, no larger than a terrier admittedly, but the first in what has come to be regarded as an evolutionary classic (Simpson, 1961; MacFadden, 1992). Major changes may be observed during the history of the horses (Figure 10.35): a reduction in the number of toes from four (front) and three (back) in the first horse Hyracotherium,to three in Mesohippus and one in Pliohippus and, independently, in modern Equus; and a deepening of the cheek teeth from small leaf-crushing molars to the deep-rooted grass-grinders ofmodern horses. The changes in limb structure and teeth are linked to the overall increase in body size that occurred during horse evolution. The changes have been explained by a major environmental change that took place during the late Oligocene and early Miocene: the spread of grasslands in North America. Early horses, such as Hyra-cotherium, Mesohippus and Parahippus, were browsers that fed on leaves from bushes and low trees (Froehlich, 2002). As the forests retreated and grasslands spread, new horse lineages, such as Merychippus and Hipparion, stepped out on to the plains and put their reinforced molars to work. 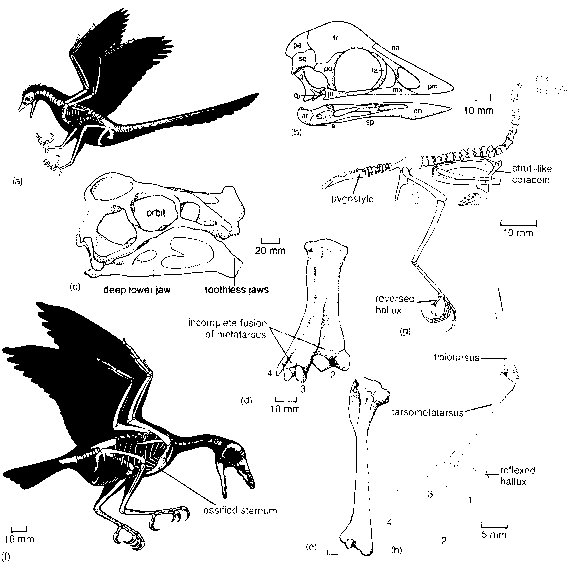 This radiation happened relatively rapidly, about 17-15 Myr ago (early mid-Miocene) in North America and rather later elsewhere, as Hipparion migrated into the Old World in the late Miocene (10 Myr ago) and eventually in South America when Hip-pidion entered 3.5Myr ago during the Great American Interchange (see pp. 320-3). Hyracotherium was a cryptic animal that escaped predators by being small and blending into the background. On the open grasslands, the Miocene horses evolved long limbs, perhaps to save on energy costs in locomotion (Janis and Wilhelm, 1993). Long legs and single hooves allowed the later horses to achieve greater speeds. Long limbs were not needed to escape predators, because wolf-like carnivores evolved only in the latest Tertiary. The dental changes were brought on by the major switch in diet from leaves to grasses. Grass contains a high proportion of silica, is very abrasive and feeding on grasses also introduces grit in the mouth. Grazers need high-crowned teeth that last for a long time, and they usually have complex infoldings of enamel and dentine to provide a better grinding surface. The story of the horses has become a textbook example of'progressive evolution' or a 'trend' as there seems to be a clearcut one-way line of change from the small leaf-eating Hyracotherium to the large grazing Equus. But there is no evidence for uniform change and the pattern of evolution is rather more complex than it might at first seem. There was no single line of evolution from Hyracotherium to Equus, and many sidelines branched off in the Oligocene and Miocene. The other living perissodactyls, the tapirs of Central and South America and south-east Asia, and the rhinoceroses of Africa and India, are related on the basis of a variety of characters (Froehlich, 1999; Norman and Ashley, 2000; Holbrook, 2001). Early tapirs, such as Heptodon from the Eocene of North America (Figure 10.36(a)), probably looked rather like the contemporaneous horses. The tapirs radiated in Eocene times, but became restricted to a single lineage after that (Radinsky, 1965; Holbrook, 2001). The main evolutionary change was the development of a proboscis or short trunk (Figure 10.36(b)). today weigh 6.6 tonnes). The horned rhinoceroses radiated widely in the Miocene. A variety of rhinos lived in the Old World during the Pleistocene, including the extinct woolly rhino Coelodonta ofEurope and Russia. although in Asia some may have survived into the Oligocene. 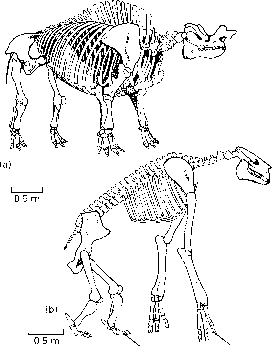 The chalicotheres, which died out in the Pleistocene, are even odder-looking than the brontotheres (Zapfe, 1979). Chalicotherium (Figure 10.37(b)) looks rather like a cross between a horse and a gorilla! The head is horse-like, but the forelimbs are very long and hindlimbs short. The pelvis is low and broad and it is likely that Chalicotherium could stand bipedally and pull down leaves from high branches. The fingers bear small 'hooves' and the toes small claws that may have been useful in digging for roots. It seems that Chalicotherium walked with its hands curled up, a kind of knuckle-walking seen elsewhere only in chimps and gorillas. Chalicotheres are closely related to tapirs and rhinos, with which they form the clade Tapiromorpha (Prothero and Schoch, 1989; Froehlich, 1999).